^ awesome! can you test a GAL? also the pic is very nice, not crappy at all...! keropi wrote: ^ awesome! can you test a GAL? Unfortunately no. I don't have the SAA chips and currently not much time to do any tests. However, I could send the card to someone (preferable within Europe) for testing. 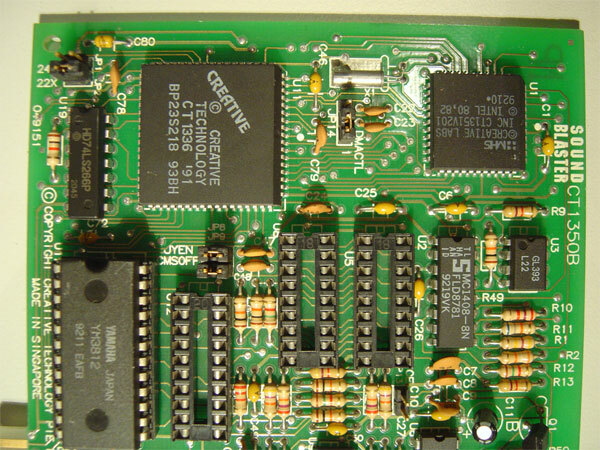 I also think that finding a card with DSP 2.02 and the CT1336A with the original CMS chips should be on the list. I will certainly be on the lookout! I'm just wondering what is the fascination with the 2.0 over the 1.5? I swear the 1.5 sounds clearer / rawer and doesn't have the -5V requirement. SB 2.0 supports 44.1 Khz sample rate instead of 22.05 Khz for 1.0/1.5. Not sure if any games of corresponding period have 44 Khz samples though. BTW, are we sure that it's the DSP or bus controller chip? Some of the species have the big YM3812 chip, others have compact YM3812-F. Could it not be the difference between working and failing GAL? bristlehog wrote: SB 2.0 supports 44.1 Khz sample rate instead of 22.05 Khz for 1.0/1.5. Not sure if any games of corresponding period have 44 Khz samples though. I *think* I have seen entries for the Sound Blaster 2.0 in install programs, but I cannot recall any. Usually install programs list Sound Blaster, Sound Blaster Pro, Sound Blaster 16 and Sound Blaster AWE32. I have seen (Old) and (New) to distinguish the Pros as well as the 1.0 and 2.0. Unless the program can distinguish the 2.0 from the 1.x, you will get 22k sampling rates. The surface mounted -F parts are pretty rare, I still believe the CT1336A is the best suspect. 5u3 and keropi can solve it for us. bristlehog wrote: BTW, are we sure that it's the DSP or bus controller chip? Not really. There's a possibility that the chipset has nothing to do with the problem at all. I don't think that we can yet rule out some flaw in a revised board design. ...represents a two-digit version code, and four-digit year/week design-date. As far as I can tell, none of the GAL upgrades have worked on the latter, "069328" boards, and while I'm still trying to identify the differences between these and the "Rev. 4" boards, I've only noticed changes around the crystal so far. So, while it's already known that there are six versions of the CT1330, SBPro1, we're apparently also looking at the same number of SB2.0 cards, and at least SEVEN versions of the CT1600, SBPro2. Have fun collecting them all! What was the actual label on the GAL that was dumped? And when you ordered the saa1099 chips from Creative did they wanted the "rev" info at all? Stefan_L wrote: What was the actual label on the GAL that was dumped? 0048013500 - Same as the other known PAL chips. Creative likely ceased selling the C/MS upgrade long before the later cards were available. The documentation for my own "069328" board (having both DSP v2.02 and the CT-1336A bus-interface chip) lacks any mention of optional C/MS capabilities, and likewise fails to describe the "CMSOFF" jumper at all. I wonder if the marked rev 2, rev 3, then the marked rev 4 are the earliest boards, and the unmarked revs with the six digit number on the bottom are the later cards. This would fit with the empirical evidence. People have complained about having trouble with the unmarked rev boards from almost the very beginning. If those boards have the 2.02/1336A combo, then they have not worked with the upgrade. 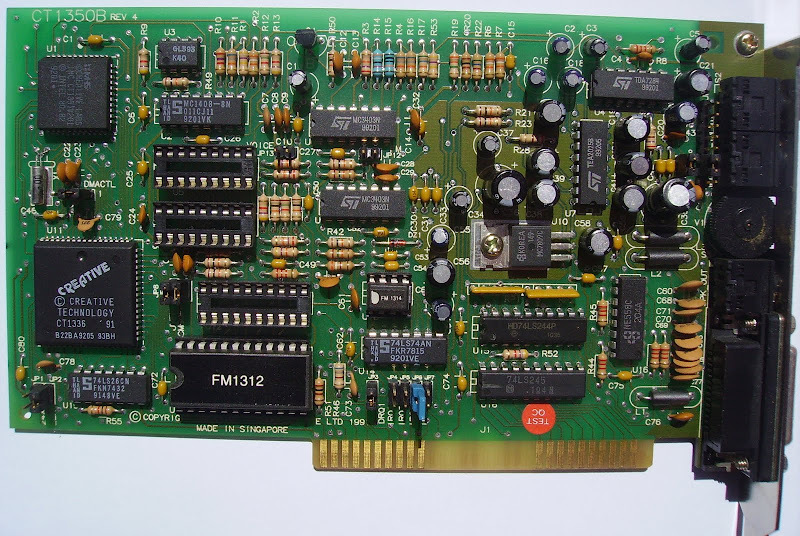 We need to test 5u3's card, i can test it too, because i have GAL's and i can program them. Plus, i already stated at vintage computer forums that GAL brand has nothing to do with the problem, as a Lattice GAL works fine just like the NS one. So i can test both. I'm actually most certain that 5u3's card will work, it has the same 049151 marking as my card, except it has a 2.02 DSP So it will absolve the DSP from any guilt at least. It would be nice to test a 059316 revision. Also, it seems that revisions 059316 and 069328 all have the CT1336A. I'm still inclined to think that the bus chip is the culprit. So we also need to test a 059316 as the upgrade has been failing on 069328 every single time. Great Hierophant wrote: I wonder if the marked rev 2, rev 3, then the marked rev 4 are the earliest boards, and the unmarked revs with the six digit number on the bottom are the later cards. I strongly believe that those cards are the earliest. Actually i have no doubt whatsoever. Sorry, thought I'd been pretty clear, but yes, the printed "REV" = earlier board. Creative obviously couldn't stick with this designation method, because, let's face it, seeing "REV 4" or "REV 6" on anything is pretty much code for "This company has no freaking idea what they're doing." Last edited by Cloudschatze on 2013-6-22 @ 20:31, edited 1 time in total. My card appears to be 059316. 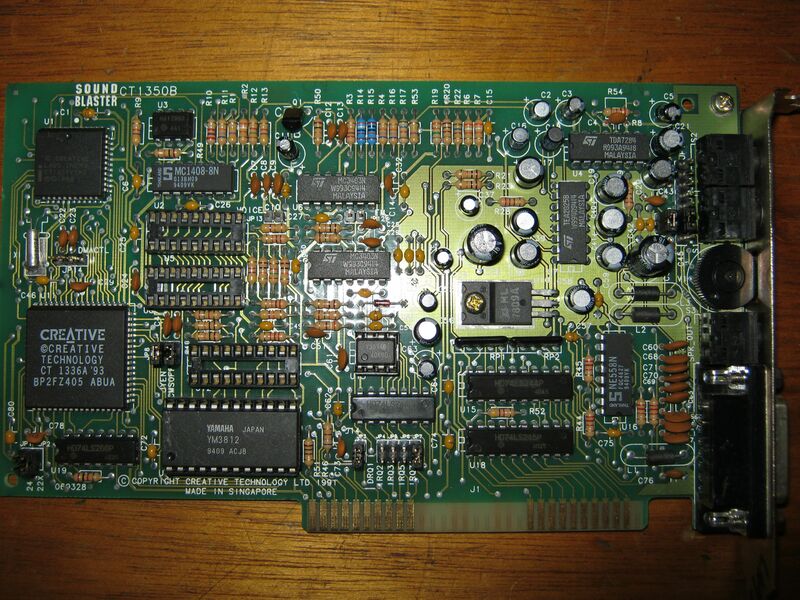 Same with the other card of russian retro-gamer community. 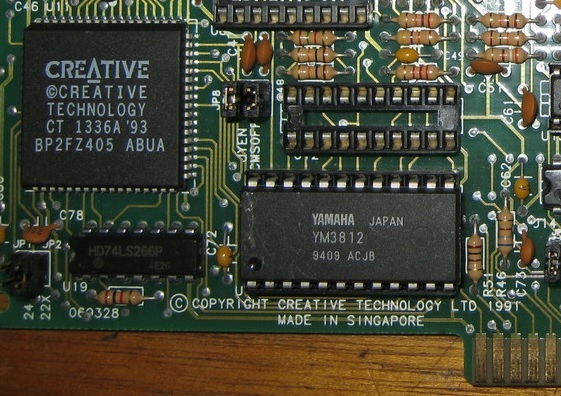 Notice that bus controller chips, albeit being both 1336A, have different printings over them; the YM3812-F chips have some cryptic 'EAGB' and 'EAMB' letters. 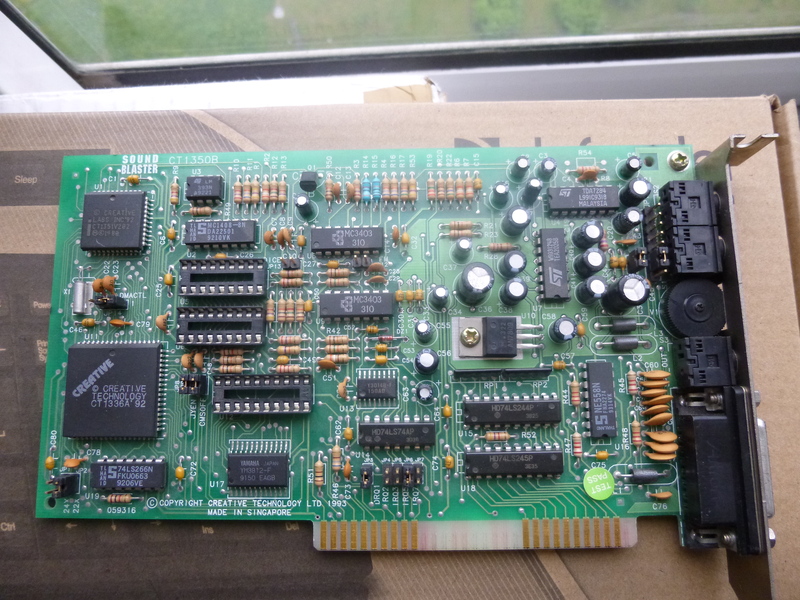 The collector from Ukraine has a 049151 revision card but with 2.01 DSP unlike 5u3's one. 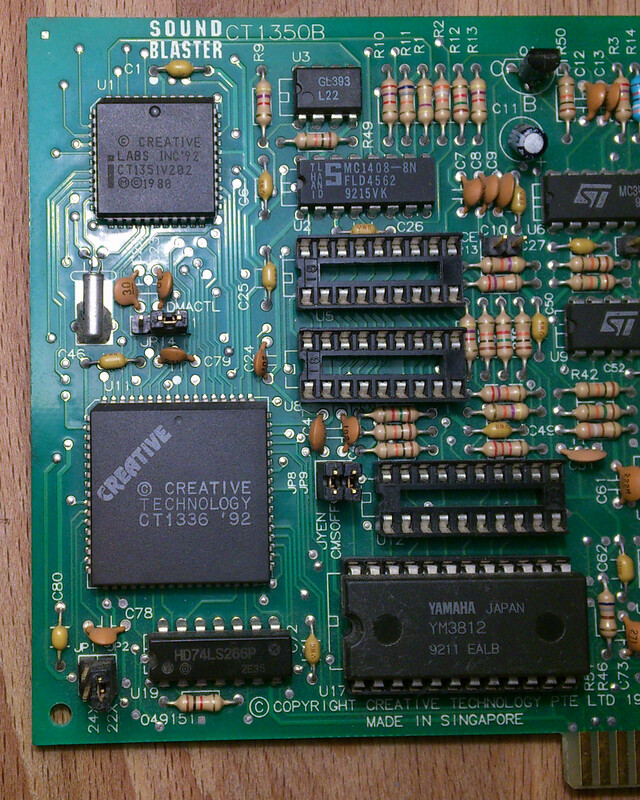 The CT1350A marked card I mentioned earlier appears to be a 049151 card with 2.01 DSP and CT1336 bus controller. Last edited by bristlehog on 2013-6-22 @ 20:41, edited 2 times in total. The "Rev. 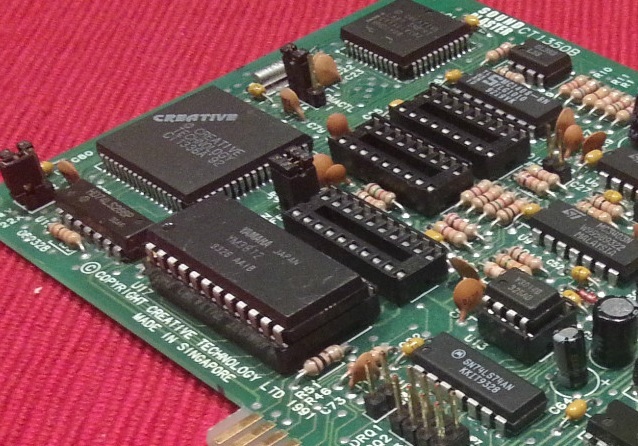 06" board is a modification of the 1991-dated, "Rev. 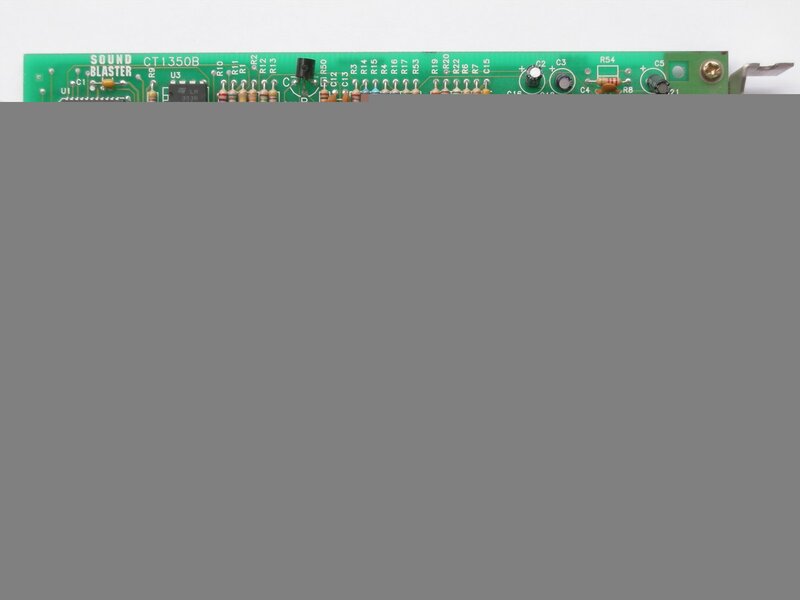 04" board design. Ignore the copyright date and go off of the "069328" board date instead. When do you anticipate being able to test your cards? Cloudschatze wrote: When do you anticipate being able to test your cards? Hard to say precisely due to unreliable work of Russian customs and post services. May widely vary from end of June to end of August, if nothing gets lost on its way. I currently have no 'cards', only one 059316 revision card. As for the other russian guy, he lives in another city and it could take an additional month to deliver him flashed GAL chip to test his 059316 SB.